Butter and other dairy fats are controversial subjects in the world of nutrition – some people swear that the right kind of dairy fats can be beneficial to your health, while others insist that plant fats, such as olive oil, are better for you. But regardless of which side of the fence you sit on, it’s important to read all the evidence before you make a decision – and there is significant evidence that while consuming large quantities of butter is ultimately bad for you, moderate amounts of butter from grass-fed cows have health benefits that standard butter from non-grass fed cows does not have. 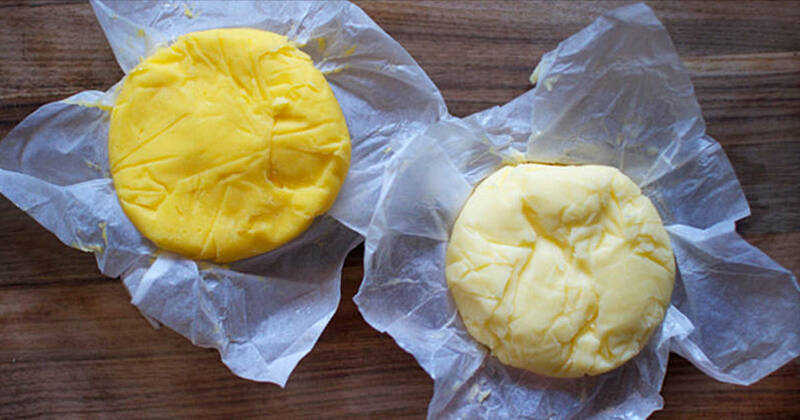 Butter, which is made from milk fat, is a highly complex nutrient, containing 400 different fatty acids. It also contains fat-soluble vitamins and provides plenty of energy due to its high calorie count. But what is the difference between regular butter and butter from grass-fed cows? Studies comparing butter from grass-fed cows to butter from non-grass fed cows have consistently shown that the former is much higher in valuable nutrients like omega-3 fatty acids and vitamin K2. It also contains up to five times more of the fatty acid known as conjugated linoleic acid (CLA), which is popular as a weight loss supplement and has significant health benefits. In short, butter from grass-fed cows contains more nutrients and is better for you than butter from non-grass fed cows. Common wisdom has long been that butter is bad for your heart. It does contain large amounts of saturated fats, which to many is synonymous with heart disease. However, research on the effects of the consumption of saturated fat on heart health has recently shown that there may be no significant connection between moderate consumption of saturated fats and the development of heart disease. One massive systemic review, published in the journal Annals of Internal Medicine in 2014, even called for a rethinking of most cardiovascular health guidelines. “Current evidence does not clearly support cardiovascular guidelines that encourage high consumption of polyunsaturated fatty acids and low consumption of total saturated fats,” the researchers wrote. In fact, doctors and scientists have noticed that in countries where cows are largely grass-fed, there is an inverse relationship between the consumption of full-fat dairy products such as butter, and incidences of heart disease. The American Journal Of Clinical Nutrition reported on these findings in 2010, looking at the levels of conjugated linoleic acid in the fat tissue of 1813 heart attack patients and comparing them to an equal number of subjects with no history of cardiovascular incidents. In Costa Rica, where cows are commonly grass-fed, the more full-fat dairy people consumed – as evidenced by their levels of conjugated linoleic acid – the lower their risk of developing cardiovascular disease. While researchers on this study were not able to prove causation – that the higher levels of full-fat dairy in subjects diets were directly linked to the lower risk of heart attacks – the results of this study are still important to our understanding of the role that dairy fats can play in our diets. In fact, similar studies in other countries produced similar results – most notably in Australia and European countries. What Conclusion Can We Draw From All This Research? While saturated fats should always be consumed in moderation and as part of a balanced diet, there is concrete evidence that in moderation, and from the right sources, saturated fats such as full-fat dairy products may, in fact, be good for you.